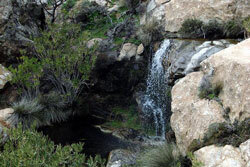 From Apeiranthos and following the central road again, we come to Stavros of Keramoti. From this spot, both the western and eastern shores of the island are visible. A downhill road leads to the small village of Keramoti, built in the depths of a gorge. 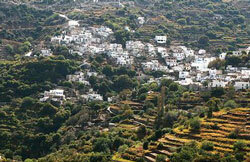 Our next stop is in Koronos (36 km from Hora) a beautiful village built in a valley at a height of 540m. Koronos preserves its traditional island color and is of great architectural interest for its mansions and simple houses and its long, uphill mule paths. A visit to the folk art museum is recommended. Just before the village there is a winding road which, after a downhill drive, leads to the beach at Lionas with its large round white pebbles and crystal clear waters. There is a small settlement here and on the way to Lionas the galleries of the emery mines are visible. The next village that we come to after Koronos, is Skado. Here the road divides into two, only to be rejoined again, a just outside Apollonas. The right hand route takes us through the village of Mesi, following a course which offers a panoramic view of the north-eastern shores of the island.